Posted February 1st, 2018 by Jeremy Dalton. Can you imagine how great your life could be if you could just press a button and all your tasks would be completed? Well, if not all, a lot of your tasks can be managed with just the press of a button owing to the technological advancement in the present era. Now you can make your home lit up by pressing the switch from your car or you can adjust the temperature of the house if you are not away, thereby saving on the energy bills to a great extent. This is the power of automating your home. 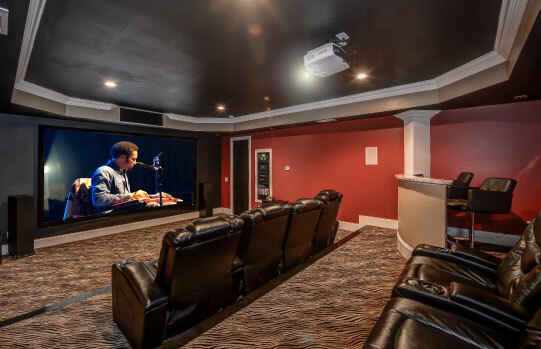 We, at Atlanta Entertainment Systems, are one of the most experienced and reliable home entertainment systems, home theater installation, and home automation companies in and around Atlanta, Brookhaven GA, Buckhead, Griffin GA, Marietta, and McDonough. So, if you are still unable to understand why you should automate your home, here are a few reasons you should take a look at. Instead of repeating your daily chores manually again and again, you can now do so within a few steps with home automation. Earlier, you had to turn off four different lights to dim the light of the room but with home automation, you can do the same with just one button. Energy bills usually amount to a lot of money. With automating your home, you can save on your energy bills by just turning off the lights and lowering the thermostat automatically if you are not using them. Home automation enables you to light up areas like stairways, wardrobes, or other dark areas as soon as you enter, reducing your chances of accidentally tripping or running into things, thereby increasing your levels of safety at home. So, what are you waiting for? Quickly give us a call at 770-744-5373 now and install the home automation system from us.